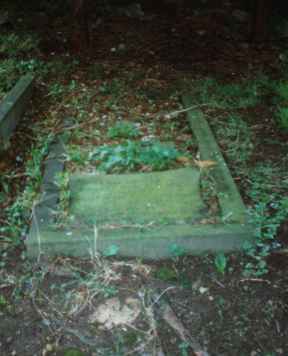 Son of Annie Taylor Short (formerly Neate), of 100, Wood Lane, Chippenham, and the late Richard Neate. Born at Castle Combe. Among those who fell at Zeebrugge on April 23rd was Cpl RHR Neate son of the late Mr R Neate of Castle Combe and of Mrs Short now residing at Englands, Chippenham, whose husband Pte W Short formerly a postman at Chippenham is serving in France. Cpl Neate had barley reached the age of 22. Educated at the school at Castle Combe and later a member of the church choir, he left home some years ago and was apprenticed to a motor tyre manufacturing company in Birmingham. But his liking was the sea and five years ago he joined the Royal Marines. 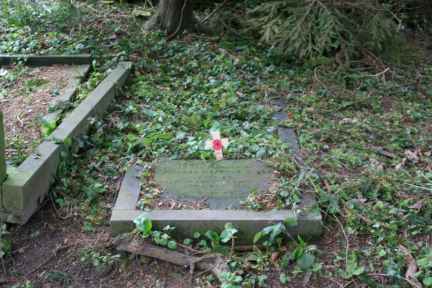 He served for some time at Deal and had as a non commissioned officer officer, Sgt TJ Ball of Corsham. Later he went to the North Sea and then for some time was stationed in the Orkney Isles. He was home on leave about six weeks ago, returning to duty on March 27th. Soon after the attack on Zeebrugge was arranged. Cpl Neate was one of the volunteers in that hazardous undertaking. When the world was informed of the splendid account of our men on that occasion, the news was conveyed to Mrs Short as to many other proud though heartbroken mothers that her son was among those who had given their lives in their country’s cause. It was intimated by the authorities that I t would be possible for the body of Cpl Neate to be sent home for internment and through the good offices of the mayor, this was accomplished. The body returning to Chippenham on Sunday afternoon (28 April). The coffin covered with the Union Jack, was placed on a bier and conveyed from the station to the mother’s home in Englands. Four wounded soldiers from the Red Cross Hospital accompanied the removal to the house. The arrival at the station coincided with the return there for entraining of the Volunteers who had been engaged in that alien drill at Westmead and as the coffin was conveyed from the station It passed in front of the men who formed up and came to the present. A similar honour was paid by the Volunteers met with passing through the town. The funeral took place on Tuesday (30 April) and prior to the internment at Castle Combe, a service was held at the Chippenham Parish church. The vicar officiated and with the junior members of the choir met the cortege at the west door of the church. The coffin was carried by wounded soldiers from the Red Cross Hospital under the command of Sgt Wilson. The congregation included the Mayor and members of the corporation and also many towns’ people. At Castle Combe, there was a large assembly of villagers and black curtains were drawn at every house approaching the church. Chippenham Volunteers under Sgt Devonald formed the firing party. They were formed up and came to the present as the coffin was placed in the grave, which had been dug under a stately Yew tree in the church yard. The Rev FKL Appleyard officiated at the burial. After the service, three volleys were fired and Bugler L Wright sounded the Last Post. Amongst the mourners was Lt Cdr Watkins DSO. Mrs Short tenders heartfelt thanks to all kind friends for their messages of loving sympathy with her and family in their sad bereavement. Wilts Times 4 May 1918. The Mayor referring to the attack on April 23rd said the council would, he was sure, be proud to know that Chippenham was represented in that gallant exploit, though he regretted to add that the lad to whom he refereed, Corp RH Neate had lost his life in the venture. The town had an opportunity of honouring the memory of the deceased as the body had been brought home and interred at Castle Combe, where the residents paid every respect and it was pleasing to hear from the villagers that Corp Neate had worthily lived up to the good opinion formed of him as a lad (hear hear). The parishioners have subscribed for and erected in the churchyard a memorial stone over the grave of L/Cpl Richard Neate RMLI who was killed in the attack on Zeebrugge on April 23rd. 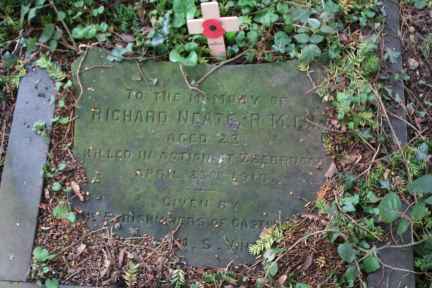 In ever loving memory of Cpl Richard (Richie) Neate of HMS Vindictive who gave his life in the exploit of the navy in it’s attack on Zeebrugge on April 23rd 1918 aged 22 years. Can equal that which death for thee has won.